One thing Iâ€™ve realized since moving to Detroit is that the city is like an island. I suppose in some ways all cities relate to each other socially, culturally, and politically like bodies in an archipelago, but Detroit, more than any other place Iâ€™ve experienced, has the distinct feeling of a world apart. This very modernist sensibility of the city as an autonomous space is expressed visually by Detroitâ€™s unearthly postindustrial cityscape, and is manifested culturally by a make-do spirit that fosters creativity, experimentation, and generally imagining things to be otherwise. In many ways, Detroit exists in a vacuum, so consumed by its own issues that it overlooks the happenings in neighboring cities closer than its own suburbs, namely Windsor, Ontario. In essence, Windsor is Detroitâ€™s Canadian counterpartâ€” a city irrevocably hit by the decline of the auto industry that now has fallen victim to benign neglect. Windsor, like Detroit, has cultivated a vibrant creative community anchored by various academic and cultural institutions. 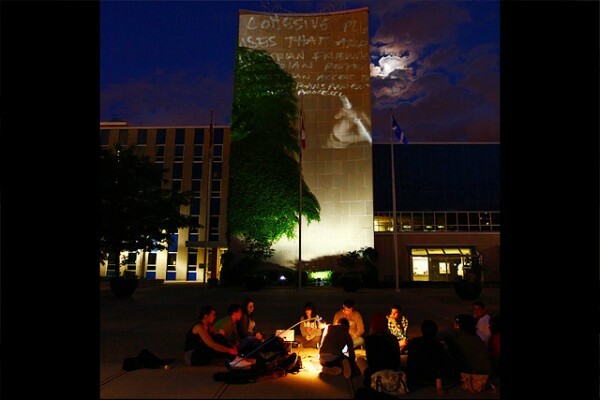 One artist-led collective, Broken City Lab, has taken on the task of making things better, starting with Windsor and progressively reaching out to other Canadian rust belt cities.Â Through multidisciplinary projects and civic interventions, the collective has adopted the city itself as a laboratory, unpacking locality and invoking alternatives through community-based social practice. 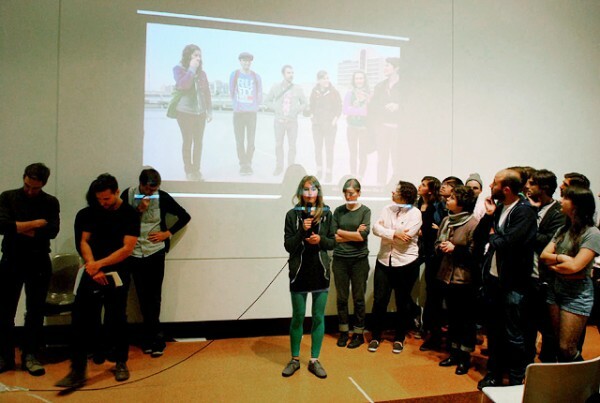 Broken City Labâ€™s activities include research, writing, workshops, participatory projects, and interventions. Recently, the cohort coordinated a conference on collaboration and social practice entitled, Homework; painted the words, As of 2011.09.21, We are Alive and Well, on a Windsor-owned parking lot; published two books containing texts, proposals, and projects to complete the long-term research endeavors How to Forget the Border Completely and Save the City; and held an informal City Counseling Session where the Lab projected the meeting notes on the exterior of Windsorâ€™s City Hall. 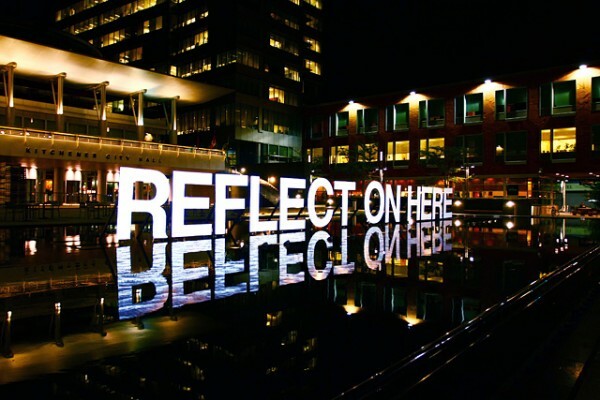 What first brought the collective to my attention was a project that directly provoked Detroit from the Canadian border. 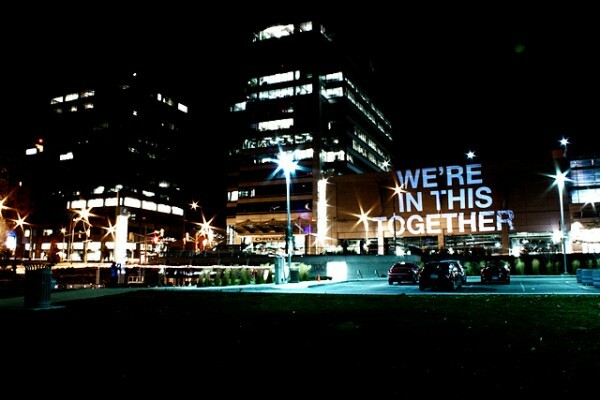 Cross Border Communication was a series of messages, including â€œWeâ€™re in this together,â€ projected on the Windsor waterfront aimed at Detroit.Â The medium of Cross Border Communications invoked Jenny Holzer, but the messages were much more to the point, optimistic, and humorous than any twentieth-century text-based predecessor. This attempt to break down walls, whether between cities or between neighbors, is truly the crux of Broken City Labâ€™s praxis. The predominant medium of this work is collaboration and discourseâ€”what Gregory Sholette has termed creative dark matter, which allows for experimentation, tactical subversion, and community-based political intervention. I spoke to the founding members of Broken City Lab in their home in Windsor. Sarah Margolis-Pineo: What inspired Broken City Lab? Danielle Sabelli: It came out of a conversation Justin and I were having about the possibilities and limits of protest. I didnâ€™t think it would turn into anything, but Justin took that conversation and ran with the idea. Justin A. Langlois: I remember thinking that the model of protest had failed in that it never seemed to actively engage in conversationâ€”it just seemed to say no. It all feels a bit quaint now to be thinking about how polarized I viewed protest and any other sort of civic engagement towards creating change in a community, but that’s where it started. I think seeing Occupy unfold has offered me a more nuanced view of what that sort of practice can do, namely, create an appropriate venue and platform for conversations around common experiences and frustrations, and in turn, I think more and more of what we do is something along those lines; that is, creating the opportunities and occasions for conversations around the places we live. So, shortly after this conversation with Danielle, I wrote a page of bullet points that outlined a way to get together and do something collectively. This was also in reaction to perhaps the boredom and uncertainty I was facing doing my grad work in the studio alone. Having a background in music and media production rather than visual arts, it seemed really unproductive to me to spend so much time in isolation, only to talk about what I had done rather than what I was doing, so I’m quite sure that this page that I wrote in response to a conversation about protest was also driven by me looking for a different way through my MFA. Anyways, I titled this document Broken City Lab and went about recruiting a few other students. We started with the idea of teaching one another skills and experimenting on developing these small-scale tactical gestures, all of which would somehow address the City of Windsor, or maybe more accurately, a neighborhood, a street, a backyard, that sort of scale. SMP: Iâ€™m interested in the use of Lab in an art context. Why the name Broken City Lab? JL: I think it was probably a couple things. Natalie Jeremijenko was doing X Design Lab, and there was Graffiti Research Lab, both of which presented an interesting model for working within and outside of art contexts. 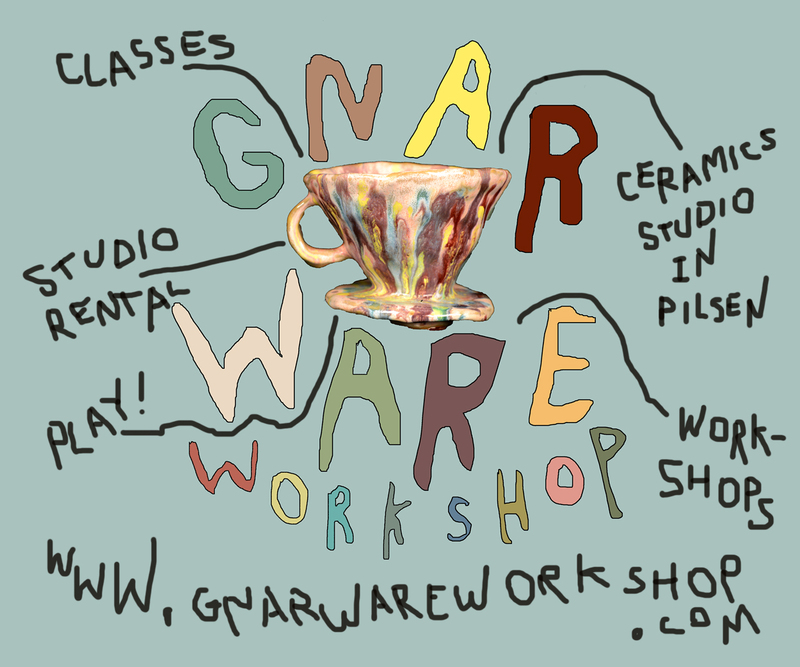 We thought this idea of taking different terminology would help us move a little bit outside exclusively art circles. DS: And I do remember when we first started out that summer, a lot of our projects addressed the fact that we were calling ourselves a lab and took a scientific approach. We went back into our memories of grade-nine science class, and there was this acronym that we all remembered for the scientific method. The first project that we applied it to was Seed Bombs. It was really funny to work through that process and do it in a really rudimentary way. JL: I think that borrowing from this corrupted memory of scientific method got us immediately focusing on process and really investing in it. DS: And it was a really good starting point because we fumbled through it. Even though we had somewhat of a working knowledge of it, we sort of adapted it to how we thought and I think that has sort of evolved over time. SMP: One thing Iâ€™ve noticed about your work is that the projects are always ongoing, which is certainly in the spirit of the laboratory as wellâ€”nothing is ever completed, itâ€™s always evolving. Iâ€™m curious, how do your projects germinate? JL: A lot of the work is about trying to explore how we enact, think about, and explore locality. So the city becomes one of many parts of this matrix of locality and it spans from very small scale to very largeâ€”from people to buildings. When weâ€™re bringing projects to other places, and this has been in the last six months or so that weâ€™ve been focusing on work outside of Windsor, I find that weâ€™re pulling from the playbook of tactics and research that weâ€™ve created through our work back home. As far as how projects get developed, I think weâ€™re still doing what weâ€™ve always done which is looking at what is catching our attention in the cityâ€”what sort of makes us at a very personal and immediate level think that this is not working. Thereâ€™s a lot of: why is this the way it is? And: what if this wasnâ€™t the given and there was another way to think? SMP: Is Broken City still operating with its original cohort? DS: Initially there were about four of us. Those same four are still in there now, but weâ€™ve had this revolving door approach for new members. Different people sit around the table and attach themselves to each project, so weâ€™ve had people around the table that weâ€™ve never seen in the past. The most weâ€™ve ever had is about twelve people at one time. Whenever that dwindled out, we were always left with the original core, and Iâ€™d say now, we certainly have a larger core. Thereâ€™s the four of us in addition to some fresh bloodâ€”some new, young members who are really eager, and their eagerness translates into a permanent spot within the group because they are so dedicated and devoted to what we do. SMP: Do many of your members come from a studio art background and are eager to do more socially-engaged work, or are they coming from various fields? JL: I think now, just by virtue of having some attachment to the School of Visual Arts, the last few people who have worked with do come with an art background. DS: I feel like people outside the visual arts are a bit more reluctant to participate because many people still have a problem understanding why the work we do is art, and consequently, they may not understand their place within our work. I think some people might be interested in what we do and want to learn more about it, but those outside of art or any art background seem to find it difficult to plug-in to the things we want to do and the way we want to do them. Being an artist is a really sacrosanct position, and I know for myself Iâ€™ve struggled with this idea that even though Iâ€™m not pursuing it anymore, [as a second-year law student] am I still an artist? I feel like thatâ€™s a boundary that many people outside visual art donâ€™t want to come within, even though we really try to encourage people from other disciplines. I think by terming ourselves an artist collective sort of deters people who arenâ€™t artists from wanting to participate. SMP: How does the decision making process work in a collective? JL: So this is an interesting question, and I donâ€™t want to say much because I want to hear how Danielle sees it happening, but what I will say is that a lot of times I have to deliberately put issues on the table and go around and see what everyone thinks. That being said, I also am fairly certain that anyone who feels into an idea enough and really want to see it happen, things will definitely move in that direction. DS: Well, in terms of specific projects, most often weâ€™ll talk about the project itself and start to develop ideas and add on to the ideas. I feel itâ€™s this process of everyone is contributing until we hit on it and are all: thatâ€™s it, thatâ€™s what we want to do. You forget who it was who made that call, but you know that everybody participated to get to that point and everybody agreed that thatâ€™s the way weâ€™re going to go. So that often happens, but because of the nature of the groupâ€”Justin has been the professor of many people in the group and weâ€™re a bit older than many of the members, and that feeds into the dynamic as well. I donâ€™t think thereâ€™s any denying that there might be some desire to look for leadership and in some instances, that really comes into play. When we canâ€™t agree on anything or itâ€™s not going anywhere, I think that sometimes thereâ€™s that deference to the natural leaders just by virtue of age and experience. But again, most of the time, I feel like itâ€™s a very natural consensus. SMP: Iâ€™m wondering how youâ€™re able to fluctuate between street and gallery, and how you negotiate public and private? JL: Thatâ€™s a tough one. Weâ€™re still in the process of resolving that, but I think the project we did in Winnipeg a few weeks ago was the best example of how we can do the work that we do and have it be translated into an exhibition that Iâ€™m fairly happy with. Doing street art stuff has always been more fun from the beginning. Iâ€™ll always remember that when we did You Are Amazing and Cross Border Communication, every little detail and way of working just sort of synced. Those moments were what it was all about: we envisioned a project and figured out a way to make it happen. It really was a feeling like we took some ownership over that place, and that was hugely exciting. Transitioning to a gallery, I think it comes down to figuring out what we want to do with a gallery space. There are still projects that we have lined up that are going to result in a gallery show. To be invited to do shows elsewhereâ€”even other public projects, is weird because we have such an embedded practice here. It can feel like trying to take the best of collection and apply it to other places, which sometimes works and sometimes doesnâ€™t. DS: Well, Iâ€™m personally not so much interested in gallery stuff, and Iâ€™m somewhat resistant to it. 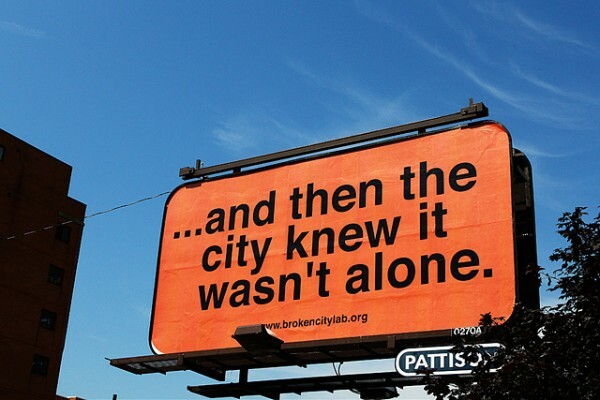 My interest in Broken City Lab reconciled my desire toward activism and artâ€”it was a new way to bridge the two together. For me, it exists on the street for that to be accomplished. So this transition into galleries, like I said, Iâ€™m a bit resistant, but I definitely view it as an exploration of space for us. 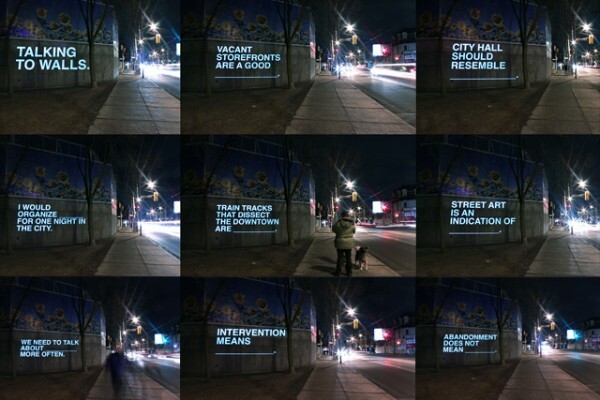 At this point, weâ€™re making use of space to address what we usually do on the street and looking at the politics within those different considerations. JL: I totally agree. Itâ€™s about the scale of approach. When we were a little ad hoc collective, we could respond to something and then pick up with the next project. Now, Iâ€™m interested in understanding what can you do if you frame yourself as a type of formal organization or institution or something, so at that rate it becomes crucial to work through that gallery dynamic because itâ€™s the only way to then move on and do other things. With a wide enough view of what we might want to do, I think thereâ€™s a pragmatic reason to consider working through that. But I think itâ€™s a really good way to frame it as a continued exploration of spaceâ€”not just architectural space, but especially in Canada, this idea of: what is an artist-run centre supposed to do? DS: Also, if we look at the progression of what weâ€™ve done, where we started and where we are now might seem completely antagonistic to one another.Â When we started out, we were more interested in guerrilla tactics. We werenâ€™t asking permission, and were just doing what we wanted. We just went out and we did it, and thatâ€™s what Iâ€™ve been wanting to get back to. But then, over time, weâ€™ve realized that we can do more if we ask permission and have some sort of dialogue with the city. If we do it legitimately, weâ€™ll have access to these larger things where we can make better projects. So it turned from doing things guerrilla style without asking any permission, to now at times, really institutionalizing ourselves within a gallery. So, one way that I look at it from my background, is I still want to look at it as being the wolf in sheepâ€™s clothing. I still want to agitate and do all of that, but at this point, weâ€™re doing it from a place where thereâ€™s this institutionalization and legitimacy. I hope it comes around full-circle. JL: But I think it has. By getting permission to do huge things like painting text in a city parking lot, the intervention is as much on the parking surface as it is on the infrastructure of city hall. To me, the more things that we do in a formal wayâ€”for example, getting non-profit status and applying for foundation grants, these things become ways to push the mandates and boundaries of institutions. It sounds kind of grandiose, but if a foundation gives us money to open an alternative space, their decision to do so will be so much different than anything else theyâ€™ve funded in southwest Ontario. Like, ever. So for me, thatâ€™s an intervention on another level. SMP: Can you elaborate on the role of the social in your work? What interests me about the scope of your practice, as you mentioned, youâ€™ve gone from a very call-and-response way of employing text, to now, actually generating your own content through participatory projects. In my mind, thatâ€™s what distinguishes a number of historic text-based and social intervention-based work from more contemporary iterations of discursive or social practice. Iâ€™m wondering if you could speak to this particular trajectory and also to the role of the social in your practice? JL: I think that the most honest way for us to speak about the work as social practice is to locate that practice in the collaborative processâ€”the actual sitting around the table and doing the work. The collective is as much the work as anything that comes out of itâ€¦Going out and trying to create these opportunities for discussion that can feed into works, itâ€™s always the most challenging, but when it works, itâ€™s really great. I think that as we travel to other places, weâ€™re trying to develop a way of doing this. In Calgary, we were doing this on the street sort of survey of post-it notes, and thatâ€™s a very visible thing, but the depth isnâ€™t there obviously. Weâ€™ve done a lot of fill in the blank things, and thatâ€™s one of my favorite tools because it collects data really effectively and also creates this moment where the person doing the fill in the blank can really assume some ownership over the existing structure. I like to understand our work as demonstrating the possibility for this stuff to happen, and I think of the fill in the blank as a micro-instance of that. At the end, the responses are always the most hilarious as well as the most critical and best thought out. It creates an opening into a conversation, and it gets some of the low hanging fruit out of the way and starts to get into places of richer conversation. SMP: How do you negotiate the unknown elements of soliciting participant/viewers for your projects and performances? JL: Iâ€™ll say that one of the best rates of response that weâ€™ve gotten was when the communication was online. Our Text in Transit project we got a ton of responses. We printed one hundred individual panels and I think we got at least double that, which was a lot, and that was all through an online form. In London, [Ontario], the research we did there was largely through Twitter and through another form that was on the websiteâ€”a whole list of questions, and we got about 80 responses. 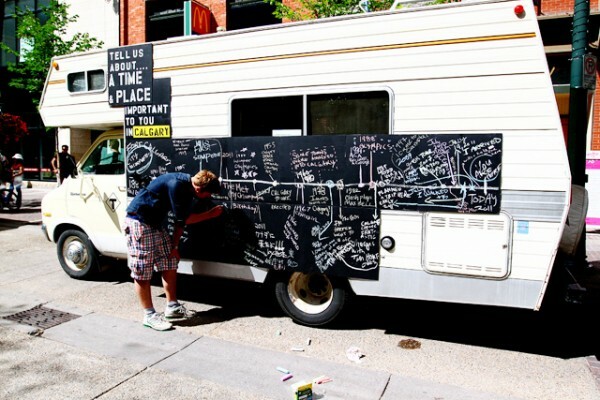 When we were out in Calgary, we probably got about 60-70 people to engage with us, and that was on a busy street. So, I think weâ€™re increasingly finding that if projects require more engagement, one of the best ways to solicit participation is online. When we were in Winnipeg though, we hosted two workshops with eight to ten people each, and they were so sharp, and it was so amazing to get a different level of conversation going. SMP: Is the lack of face-to-face contact satisfying for you as the organizer? JL: Well itâ€™s differentâ€¦I think itâ€™s important to try and get whole range of responses. They donâ€™t necessarily have to be deepâ€”itâ€™s all about the shorthand and the headlines that actually shape someoneâ€™s experience of a place. The other thing is that Iâ€™m always nervous in some way that some people read the work as a comprehensive and exhaustive survey of every demographic, and itâ€™s never like thatâ€”itâ€™s really random! Especially when we do stuff online, thereâ€™s definitely a very specific age and generational audience that is cultivated, and I donâ€™t think that thatâ€™s a bad thing. The work isnâ€™t trying to be comprehensive, itâ€™s about trying to pick up things that really open up a larger conversation. SMP: Borders are a reoccurring examination in the work of BCL. Why have you selected the notion of borders as a point of engagement? DS: What was our first border project? Was it Cross Border Communications? DS: And a lot of people who grew up here, grow up with this fear of Detroit. Itâ€™s about breaking that down and having some sort of dialogue with a city thatâ€™s closer to us than other parts of Windsor. We found it very strange that this wasnâ€™t going on. We have similar concerns, and yes, we are a totally different country, but that shouldnâ€™t necessarily inhibit any dialogue that we have with Detroit. JL: The other funny thing is that Windsor is very concerned with being a border city, and I donâ€™t think Detroit is. So, increasingly as we do this work around bordersâ€”charts of effectiveness for playing with Detroit, and other simple things like pen pals and house swappingâ€”it became this idea generator that explored how to break down the border between these two places. With our How to Forget the Border Completely book project, its also playing with this notion of how you get beyond the tough looking person in the booth to get where youâ€™re going. All of that is, in my mind at least, is becoming increasingly self aware that these concerns exist on this side of the border and not so much over there in Detroit. And I get itâ€”there are many more immediate things to be worrying about in Detroit. Ultimately, whether or not people consider crossing over to Windsor, itâ€™s not really going to change whatâ€™s on the ground over there. SMP: Do you see culture as an appropriate venue for this dialogue to occur? DS: Well, what I mean is that artists are more willing to talk to other artists about things, and develop ideas from an artistâ€™s perspective that are totally different than from a politicianâ€™s perspective, where theyâ€™re negotiating things between the two cities at a much different level. JL: Okay, so I think itâ€™s highly political, so maybe what we can say is it shifts the scale of conversation. This is what cultural dialogue can doâ€”it brings it into a much more immediate sensibility. 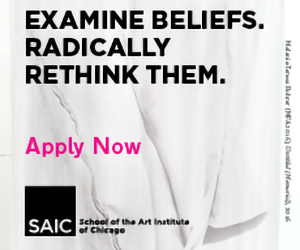 SMP: Maybe another way to approach this question is to ask you to address your own relationship to power and politics and the role of art as an agent of socio-political change? JL: What we want to do going forward and possibly opening our own space is to refocus our work back to the questions: how does art operate? How can artists become community leaders? How can we create a way of working that is no longer an abnormality or something that requires a biennial to be expressed? I think that art is really useful for many reasons. Itâ€™s a catalyst, point, or tool for changeâ€”it has an unbelievable flexibility, and can approach a wide range of problems. Again, approaching problems doesnâ€™t mean solving problems. I think itâ€™s actually about putting together a coherent or legible path towards a discussion about an issue. So often these issues are encountered as headlines, press releases, or really broad-strokes funding related platforms, and thereâ€™s very few opportunities to look at how one approaches these issues who is not in a positionâ€”professionally or politically, to address these problems. So art provides that flexibility and when itâ€™s done right can be a really accessible conversation, and I think thatâ€™s why working with text and doing things publicly is all a way employing a successful communication device. DS: It provides for new tactical approaches that havenâ€™t been explored yet. The reason Broken City Lab came about is because of a conversation on the more historic approaches to resistanceâ€”protest, etc. Justin was saying that we need to rethink these modelsâ€”theyâ€™re stale and we need to think of new affective approaches, and I was on the side of: it still works, theyâ€™re still effective. Through doing what weâ€™ve done with Broken City Lab, I still always held on to that, but recently, we went to Occupy Windsor, and I started to really import the ideas weâ€™ve developed as a collective and how these could be adapted to that situation to make it a bit more effective. Iâ€™m still going to hold on to historic approaches, but Iâ€™ve budged a bit. Iâ€™ll admit that our new, tactical approaches can be in a way hybridized with the old. In my mind I always wanted to keep the two separateâ€”the work we do as artists and established forms of political resistance, and I think it was just because it was easier for me to understand them. But, either way, it wasnâ€™t until we went to the Occupy first general assembly in Windsor where I really started to reflect on that and see where things could converge and we could make this mode of resistance more effectiveâ€¦ Looking at the scope of Broken City Lab, the narrative has shifted a bit. When we first started, the story about Windsor was really doom and gloomâ€”no hope, and now itâ€™s definitely at a more hopeful stage. So now we have to address something different since the situation has changed in the city a little bit, so how do we do that? Even though we take Windsor as the test subject and apply it to other cities, thereâ€™s also take back from other projects that then informs this new approach that will then be used to address these new concerns in Windsor. Itâ€™s really interestingâ€”we take this and apply it here, but now more than ever weâ€™re going to take more from there and bring it back to develop a new approach.